The Non-Commercial Stakeholder Group (NCSG) is an integrated committee of the Non-Contracted Parties House within the Generic Names Supporting Organization (GNSO). It is the home within the GNSO for civil society organizations, non-profit organizations, public interest groups, and individuals who are primarily concerned with the non-commercial, public interest aspects of domain name policy. Dr Farzaneh Badii was the previous Chair of the NCSG. 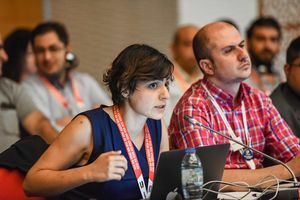 The NCSG was created after ICANN found that there was inadequate representation of non-commercial and non-profit organizations within ICANN processes. The provisional charter of the NCSG was adopted by the ICANN Board on 30 July 2009; at that time it was also stipulated that the NCSG must submit a permanent charter by the 2011 Annual General Meeting. The NCSG has thus subsumed the Non-Commercial Users Constituency, which was the original non-commercial voice in ICANN processes. With the passage of time, the NCSG has come to be seen as one of the most important and influential stakeholder groups within the ICANN community. It is known for its fierce, evidence-informed advocacy and high levels of bottom-up engagement from its members from around the world. 3 What does the NCSG do? The NCSG is the larger umbrella organization of multiple constituencies and interest groups, the most prominent of which is the Non-Commercial Users Constituency (NCUC). The NCSG was the result of a major GNSO restructuring effort, involving the creation of four new Stakeholder Groups approved by the ICANN Board in August 2008. The groups were intended to be broad organizations to better create internal balance between new constituencies; in this way, the number of consituencies can be in constant flux while important, general concerns are still being tended to and represented via the Stakeholder Groups. The restructuring was also undertaken to see the membership and role of non-commercial actors expand upon the precedent set by the NCUC, which was the original model for such a body. Thus, the NCSG was intended to broaden the approach of the NCUC, and further welcome "educational, research, and philanthropic organizations, foundations, think tanks, members of academia, individual registrant groups and other noncommercial organizations, as well as individual registrants, as part of a non-commercial registrants Stakeholders Group". The restructuring of the GNSO, and the implementation of new constituencies and other structural additions, is an ongoing process. The NCUC advocates positions on domain name-related policies that protect and support non-commercial communication and activity on the Internet. NCUC members can be organisations or individuals and are involved in civil liberties and human rights, Internet freedom issues, consumer protection, education, development, and many other areas of public policy advocacy. The NCUC supports a global and multilingual Internet and believes domain names are for everyone. In pursuing this mission the NCUC focuses on issues such as fair and balanced domain name disputes, diversity and consumer choice, and respecting human rights as they relate to the domain name system and the policies that govern it. The NCUC's global membership is made up of organisations and individuals from over 100 countries. NPOC focuses on the impact of DNS policies on the operational readiness and implementation of non-commercial missions and objectives. It aims to represent the operational concerns of not-for-profit and non-governmental organizations who have registered a domain name. Operational concerns include domain name registration, expansion of the DNS, fraud and abuse, using the DNS to provide and collect information, and how the DNS can best serve their members and communities. Proposed constituencies include the CyberSafety Constituency, and Consumers Constituency. Nondiscriminatory and impartial application of rules: The NCSG is open and represents all non-commercial stakeholders; as such, no non-commercial organization or individual will be denied membership. All non-commercial organization and individual applicants for membership in the NCSG are given equal opportunities to excel and to contribute if they meet the membership eligibility criteria and act in accordance with our standards of member behavior. There will be no discrimination on the basis of religion, national origin, gender, sexual orientation, race or ethnicity, or other characteristic. Transparency: Information on the proceedings of NCSG meetings is available to all NCSG members through the open and archived mailing lists and through other online communication channels. The schedules of various meetings is always announced well in advance. Behavor standards for elected officers: Every NCSG officer, including the Chair, must act in an impartial and accountable manner, and avoid conflicts of interest. NCSG officers must be fair, trustworthy and responsible custodians of the NCSG’s activities. Standards of member behavior: All NCSG members should behave according to the ICANN Bylaws and Expected Standards of Behavior, which supports the consensus model of treating everyone with dignity, respect and courtesy; listening and understanding others effectively; and acting with honesty and sincerity. Encourage consensus: The NCSG’s main principle is to encourage consensus, communication, and cooperation among members on various issues of non-commercial interest. develops and advocates policy positions on behalf of both its constituencies and unaffiliated members. collaborates and interacts with other stakeholders across the ICANN community on matters of common concern, including businesses, governments, and others. organizes conferences and events exploring Internet governance issues that fall within the remit of our constituencies. The logo of the NCSG is of an elephant named Turkel. Turkel was a young orphan elephant that the NCSG “adopted" at the David Sheldrick baby elephant orphanage in Kenya during the ICANN 37 in Nairobi in 2010. This page was last edited on 30 January 2019, at 14:49.